A copy of Thrill Ride will be give away to one winner if they comment, follow the blog, and share this post. OPEN TO US AND CANADA RESIDENTS ONLY. Please include your email in the comment so we can contact you in case you are the winner. Good Luck!!!! For US and Canadian Black Knights Inc. Lovers! Send us your proof of pre-order and we’ll send you a Black Knights Inc. bandana! 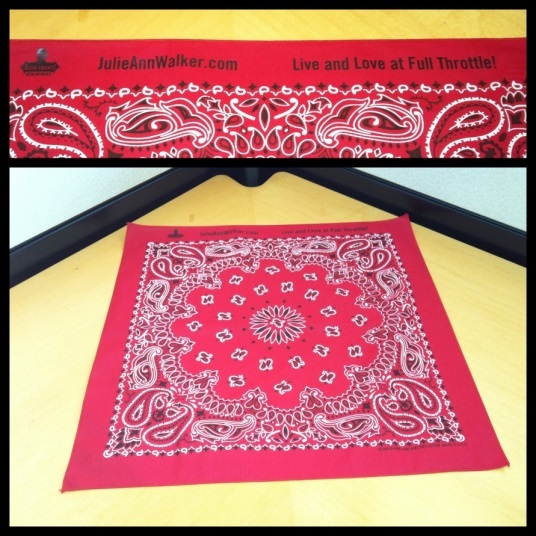 We’ll send a bandana to anyone who shows us their pre-order receipt until October 31, or supplies run out. Just email your receipt to sbpublicity@sourcebooks.com. As an added bonus: EVERYONE who receives a bandana will have an opportunity to win a fabulous motorcycle-themed gift basket, inspired by the Black Knights. All you have to do is post a photo of you with your bandana and show it to us! You have until November 15, 2013 to send us your photo! The winner will be chosen at random, and announced on Julie Ann Walker’s Facebook Page on Monday, November 18.